District 1A - South Florida (Florida members whose mailing addresses are in cities or towns south of a line extending along the north boundary of Hernando, Sumter, Lake and Volusia Counties). District 1B - North Florida (Florida members not residing in District 1A), Georgia, Alabama, Mississippi, Louisiana, South Carolina, North Carolina, Tennessee, Virginia and Kentucky. District 1C - West Virginia, District Of Columbia, Maryland, Delaware, Pennsylvania, Ohio, Indiana, Illinois, Michigan and Wisconsin. District 2A - New Jersey, New York, Connecticut, Rhode Island, Massachusetts, New Hampshire, Vermont, Maine, New Foundland, Nova Scotia, New Brunswick, Quebec, Ontario, British Isles, Ireland and other foreign countries not mentioned herein. District 2B - South/SE Texas (Texas members whose mailing addresses are in cities or towns south or east of a line extending along the north or west boundary of Jeff Davis, Pecos, Crockett, Schleicher, Concho, Coleman, Brown, Comanche, Erath, Hood, Johnson, Ellis, Navarro, Henderson, Cherokee, Nacadoches and Shelby Counties). District 2C - North/NW Texas (Texas members not residing in District 2B), New Mexico, Oklahoma and Arkansas. District 3A - Colorado, Arizona, Utah, Nevada, California, Hawaii, Alaska, Mexico, Australia and Guam. 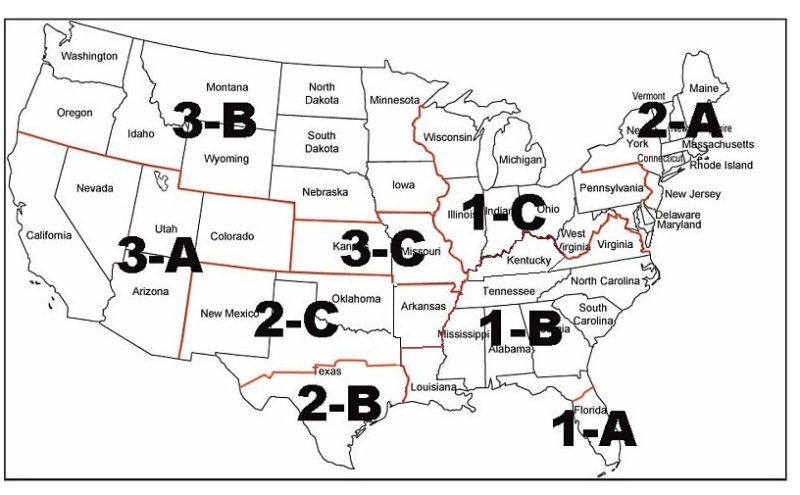 District 3B - Iowa, Minnesota, Nebraska, South Dakota, North Dakota, Wyoming, Montana, Idaho, Oregon, Washington, Manitoba, Saskatchewan, Alberta and British Columbia.